Miss Sally, Greg and I were driving in the car on our way to or from somewhere. 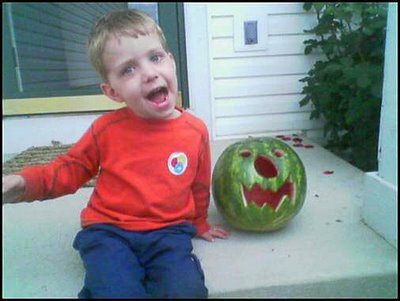 Greg said that he wanted to carve a pumpkin. I said that pumpkins only grow when it is cold and it was summer and he’d have to wait. He accepted that. Then I felt guilty for some reason and I ended up buying round watermelons that we carved. The best part about it was cutting off the top and digging in with our hands and eating the red gobs of sweet. We got sticky juice everywhere. Luckily mom was asleep.